Boston Red Sox at Baltimore - Encore! Come see the league-leading Red Sox play the hometown Orioles with your fellow alums on Friday, Saturday and Sunday Sept 7 - 9 or just on Saturday Sept 8 -- it's up to you! Due to the overwhelming interest in the August Red Sox outing, the MIT Club of Baltimore has planned another Red Sox versus Orioles @ Camden Yards outing in September! Delaware Valley alums are again invited. Cost for 3 Game Package: $56 for MIT Club members, $60 for non-members; each member may purchase a maximum of four tickets at the member price. For those purchasing the three game package (only 30 packages available), we'll have a block of seats in the Eutaw Reserve section (the "bleachers" in right center field) in beautiful Camden Yards for Friday & Sunday. For Saturday Sept 8, we'll have a block of Upper Reserve seats in beautiful Camden Yards. Cost for Saturday ONLY: $17 for MIT Club members, $20 for non-members; each member may purchase a maximum of four tickets at the member price. Or contact mitbaltimore@gmail.com or (410) 858-4784 for instructions on how to register off-line. Delaware -- Could the First State be the First in Offshore Wind Power? Wind over the ocean generally moves faster and is less turbulent than wind over land. 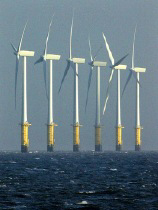 This makes the ocean an excellent location for placement of wind turbines to produce electricity. Prof. Kempton will review the technology, resource assessment, and use of wind-generated electricity, as well as discuss the environmental impacts. At the University of Delaware they have refined and developed methods for assessing the amount of offshore wind power available, based on current and prototyped wind technology. They have found that the exploitable resource of the near-shore Atlantic is 330,000 MW (average power output), which is over four times the 73,000 MW average electrical load. Professor Willett Kempton is an Associate Professor in the College of Marine and Earth Studies at the University of Delaware. His education combines electrical engineering, computer science and cognitive anthropology. He received his bachelor’s degree in Sociology and Anthropology at the University of Virginia and his Ph.D. in Anthropology at the University of Texas, Austin. Following his Ph.D., he conducted postdoctoral research in Quantitative Anthropology and Public Policy at University of California, Berkeley. His 35-year research career has produced 5 books and 60 peer-reviewed articles on topics including energy systems, conservation behavior, technology policy, and U.S. public environmental beliefs and values. Professor Kempton's current interests are (1) electric vehicles for vehicle to grid (V2G) power and (2) offshore wind power (more information, still more information). 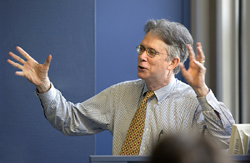 8:00 - Prof. Kempton: "Offshore Wind Power"
New Roads lead from I-95 and Rt. 202 to the DuPont Country Club in north Wilmington. Check the latest directions posted by the DCC at: http://www.dupontcountryclub.com/files/DCCDirections%28Updated%29.doc .